ALL THE TIME GOD IS GOOD! : Loving it, leaving it or losing it. Our salvation, eternally secure? Or can we leave it or lose it? Loving it, leaving it or losing it. 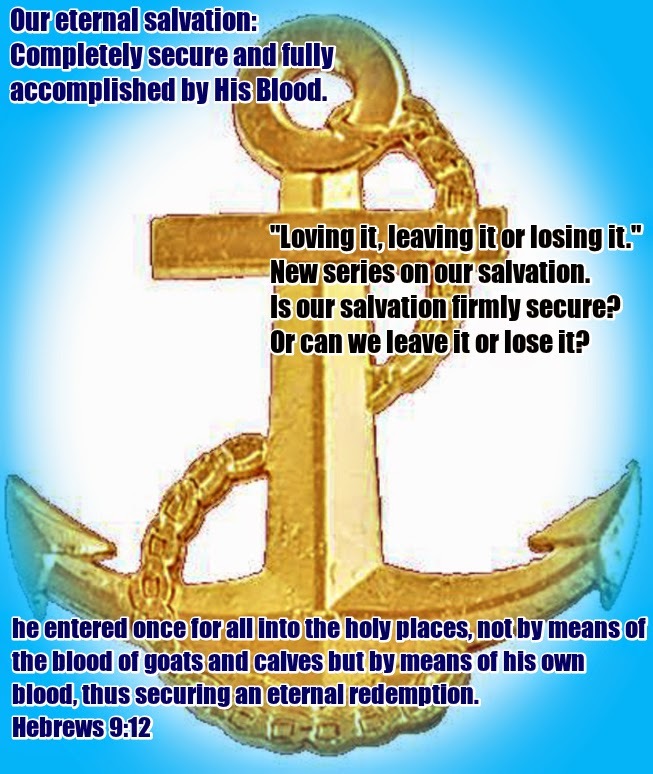 Our salvation, eternally secure? Or can we leave it or lose it? We are going further into our study of our eternal redemption in Christ. We've been looking at this for the last few posts. So, yes, this is "that kind of blog" where we teach your salvation is secure by His grace not our perfect performance. What I don't understand is the amount of controversy this Bible based teaching generates. Why fight the complete and finished work of our Savior? I have one clue (I guess because I used to be the strongest opponent of once saved always saved theology). What might that clue be? This idea that if you know your future sins are already forgiven and nothing can take you out of the Father's hands then what is to stop you from pursuing a sinful, selfish life? If you read the last four or five posts perhaps you could see the foundation I was establishing. People stop at the cross. They see the forgiveness He purchased and camp out there. So because of this they can't see the resurrection. They see how a sinner has been pardoned. Of course, if a criminal was simply pardoned then they would remain just that, a pardoned criminal. Too many see Christians as forgiven sinners only. If that was true then yes, it could be that some would pursue sin again after only receiving forgiveness. That is not what happened with us. We see from 2 Peter 1 that when we know how much we are forgiven we love much. The other vital truth that completes this revelation is the resurrection. That is after He rose and we received Him, we became partakers of that resurrection life. We are partakers of His divine nature. We are made new creatures. We are now those who rejoice knowing just how much we've been forgiven of and that we no longer live but Christ lives in us. We are new creations. When we realize this we won't pursue sin because that is not who we are. Rejoice then in the perfect and complete and totally secure salvation we have in Him. Having established this once again lets proceed to reveal what the Word says about our eternal security in Him. Over the next few posts I want to bring forth the witness of Jesus words, and Paul and even Peter from the Word of God proving beyond doubt our salvation is secure. So can we lose our salvation? Can we sin it away? Can we forfeit it? Can we give it back? Can we renounce it? Can we "walk away"? Let me say emphatically NO! NEVER! We are completely secure in Him. Now I am going to begin with Scripture proving we are secure and then answer all these objections to salvation that is secure. Lets begin today looking at Jesus words. How can we argue with the eternal, once and for all, language Jesus is using to describe salvation? He clearly, concisely, and plainly states it is not God's will that any will be lost that come to Him. Now I understand just because God's will is something doesn't mean it is guaranteed to happen. For God's will is always healing and that no man perish but receive Him. Yet, many don't receive the healing God wills for them. Many still reject the gospel message. Does this mean their will is so strong to override God's plans? I am not suggesting that. At the same time, I do believe our will is part of the equation of receiving from Him. Though God will not override our free will, He will make His plans plain and clear. He will provide all that is necessary for His plans to come to pass. So the first proof of eternal security is that it is God's will. Knowing it's God's will removes doubts and fears and traditions from our minds. Now rest assured, God in His infinite wisdom and love knows just how to get His will accomplished in our lives. He has taken many steps and made provisions to ensure when we receive Him we will persevere and hold fast and remain in Him till the day of redemption. What God desires will come to pass. You may ask what about healing? When we either pass from this life to Heaven or get caught up to meet Him in the air we will have a new body and perfect body. So healing manifests always. What about salvation? Am I a Universalist/inclusionist? No, what He promised and wills comes to pass as He said it would. He wants all to be saved. Yet not all will so He said what would happen if one rejects the offer of free grace. That will also come to pass as He said it would. Again I state then what God desires and decrees will come to pass. What is God's will then concerning eternal security? Jesus clearly said it is not His will that anyone will be lost who come to God. This is good news. We are saved and secure. We can rest and rejoice because this is God's revealed will for us. No tradition or doctrine or argument or debate can change God's will for us. We will continue looking at Jesus witness of our eternal security in our next post. I pray this refreshes your relationship with Christ. May His peace and strength be with you and His guidance lead you into all truths. Blessings to you. Thanks for reading and don't forget it's easy to sign up with your email so you won't miss any of these posts. Going deeper into truth or error?